Six different tritium breeding concepts—the Test Blanket Modules—will be tested in dedicated ''ports'' in the vacuum vessel. The successful development of tritium breeding is essential for the future of fusion energy. Tritium and deuterium are two isotopes of hydrogen that will be used to fuel the fusion reaction in ITER. While deuterium can be extracted from seawater in virtually boundless quantities, the supply of available tritium is limited, estimated currently at twenty kilos. A second source of tritium fortunately exists: tritium can be produced within the tokamak when neutrons escaping the plasma interact with a specific element—lithium—contained in the blanket. This concept of 'breeding' tritium during the fusion reaction is an important one for the future needs of a large-scale fusion power plant. 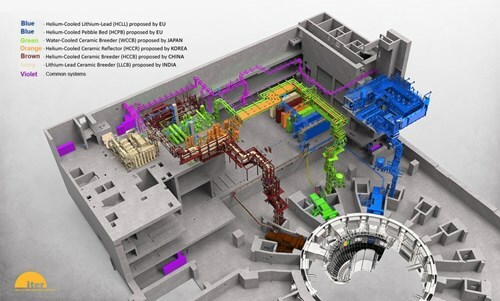 ITER will procure the tritium fuel necessary for its expected 20-year lifetime from the global inventory. But for DEMO, the next step on the way to commercial fusion power, about 300g of tritium will be required per day to produce 800 MW of electrical power. No sufficient external source of tritium exists for fusion energy development beyond ITER, making the successful development of tritium breeding is essential for the future of fusion energy.